How was your weekend?? Did it fly by? I had a three day weekend – only my second of the entire summer. I took Friday off, and I was able to relax for three full days (for the most part!) I hardly turned on my computer – which makes me a kind of bad blogger. I guess I was taking a vacation from the blog, too. On Thursday night I went out to dinner with a friend to Via in Worcester, MA. I really like Via – they have great food. On Thursday night they were partaking in Lobster Fest and I happily chose from their special Lobster menu. 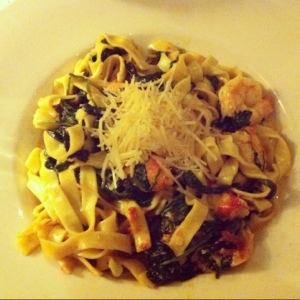 I ordered (and loved) the Lobster & Shrimp Florentine. It was amazing. The pasta was made fresh and the lobster (and shrimp) were amazing. I loved the light cream sauce the dish came in and the sauteed spinach was really amazing. A great dinner and a great way to kick off a three day weekend! I also ate oatmeal over the weekend. Sunday was such a beautiful day – it really felt like fall. It was cool, crisp and there was not a bit of humidity in the air. 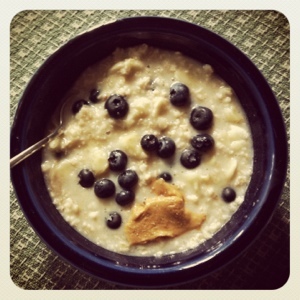 This oatmeal was really wonderful – especially with the fresh blueberries (locally grown!) and a spoonful of Teddie. On Sunday I took my new Asics out for a four mile, hilly run. They still felt “ok”. I definitely have felt “hot spots” on the balls of my feet both time I have run in the shoes. Thankfully nothing has turned into a blister yet. Back to applying Body Glide every time I run, I guess. I hope the shoes break in nicely. Other than the hot spots, they are feeling good. I have a couple of longer runs (6 – 9 miles) planned this week – I can’t wait to see how it goes. I hope your week is off to a great start. I’ll be back to report on the rest of my weekend and week in a bit. Happy Monday!